October is always a tough month for all of us at RMLSF, as well as it is for anyone who knew and loved Romeo. This year we decided the best way to honor him and remember the great man that he was, was with a fundraiser that is fun and carefree, just like Romeo. On Saturday October 22, 2016 we will be heading over to Armonk house for dinner, drinks and possibly some dancing (once those drinks kick in!). The band Weekend Update will be performing at 9:00 singing the best of Rock and Dance. A $20 donation at the door will include a raffle ticket for a chance to win some great prizes throughout the evening. 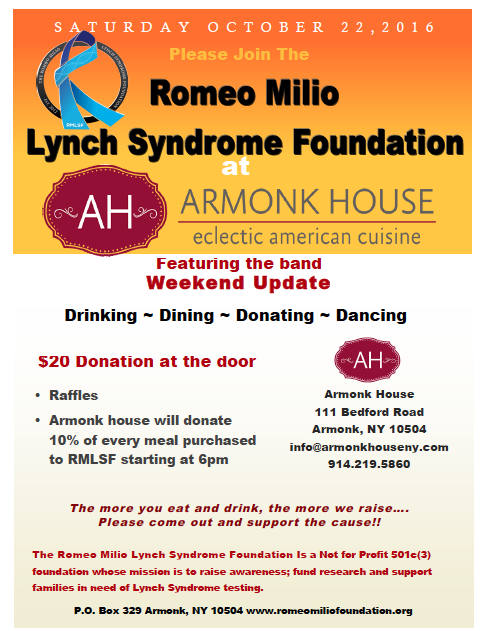 Armonk house will also generously donate 10% of the proceeds from any meals purchased after 6pm to RMLSF. So bring you family and friends, and your appetite!!!! As always we are so thankful for all of our wonderful supporters and hope to see you all there. *Donations from this event will go towards our mission to raise awareness of Lynch syndrome; fund research Lynch syndrome and its associated cancers; and support families in need of Lynch syndrome testing. RMLSF is a 501(c)(3) non profit foundation.